Brighten large commercial signs and storefronts using the 18" Barn Light Shade. This large Barn Light and gooseneck arm combination is made from commercial-grade aluminum and designed to light larger spaces. Finishing is a rust resistant powder coating and comes in 25 attractive shades; pricing varies. And for classic charm, add decorative wire guard and globe accessories to Barn Shade Goosenecks using the drop-down menus above. 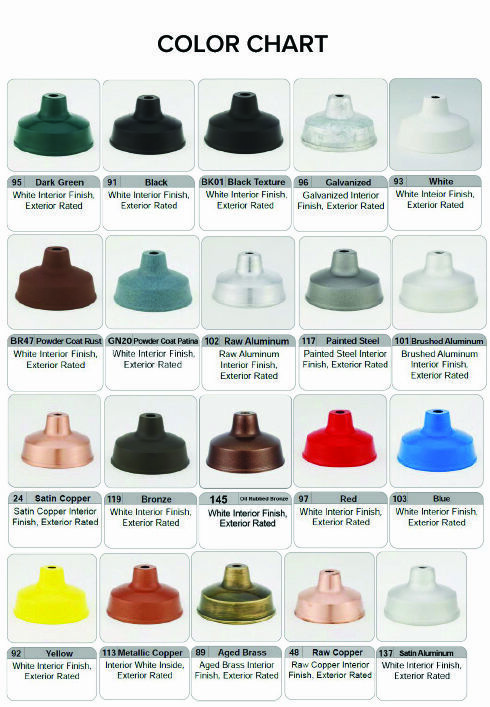 Please note base pricing is for standard incandescent sign lights rated for a 200W maximum bulb. Incandescent gooseneck lighting is UL Listed (US and Canada) and comes with a sturdy cast aluminum back plate that has mounting holes at 3 1/2" on center. This configuration is easy for installation over a standard 4"D octagon or round J-box. Upgraded lamping is also available for compact fluorescent and metal halide (MH) Barn Lights online; for high pressure sodium or LED please call toll free. Please note CF, LED, MH and HPS gooseneck lights may require a different ballast.